The Market is indeed open for business this Saturday, July 4. We encourage everyone to come out and support their local farmers, artisans, and entrepreneurs on this Independence Day! There might be peaches from Sager Farms! It won't be as hot! We've been playing with some of the photos taken at the Market - check the Flickr for more examples. Urbana's market is definitely a trendsetter in the use of internet technology. Those words appeared in the current issue of Growing For Market in their cover story about farmers' markets and social media like Twitter, Facebook, and blogs. Our use of Facebook and blogs was discussed in the article, which was AWESOME. thank you to everyone who checks this blog, who follows on Twitter, who is a fan on Facebook, and who looks at our photos on Flickr. You're proof that this crazy experiment is working! The other is the contest Care2 is doing to encourage people to show their favorite farmers' market some love - right now Urbana is in 12th place, but I know we can do better (what on earth are Flint, MI and Durham, NC doing to get that many votes?). Click here to help your Market out! The winning market receives $5,000, too, which is a lovely bonus to just knowing you're 100% excellent. All hail the appearance of the summer stone fruit! Local trees suffered greatly in this past January's freeze, but southern IL is picking up the slack. The lovelies pictured above were brought to us by Mileur Orchard out of Murphysboro, IL - they'll also have apricots, nectarines and, later in the season, apples. Let's hear it for stone fruit! Woo! Actually, let's hear it for summer produce in the house! 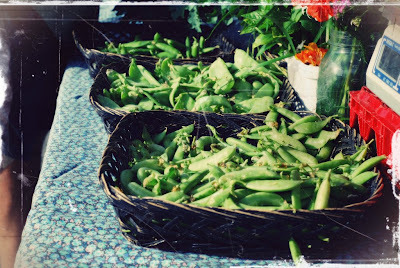 This weekend's Market will offer a record number of vendors (over 80 at last count), a Bloodmobile, Blues, Brews, and BBQ steps away in Downtown Urbana, righteous heat & humidity, and plenty more. PS: Sadly, our coffee sponsor is no longer able to provide the Market with free coffee. There are vendors within the Market and two retail establishments adjacent to the Market (Common Ground Food Co-op and Art Mart) that have excellent coffee - please patronize them! When Swedish folks wish each other a Happy Solstice, they say, "Glad Midsommar!" And, well, that works, since after a cool and wet spring, we're glad to have the warmer weather back. Did it have to make such a hot and muggy entrance, though? I know. Whine, whine. Anyway. All that rain and heat means Market shoppers will enjoy a veritable plethora of fruits and vegetables at the Market this weekend. As the last of the asparagus is harvested, the beans start to come on. As the heat and humidity start to tax the strawberries, the blueberries and peaches (you heard me!) start appearing on Saturdays. 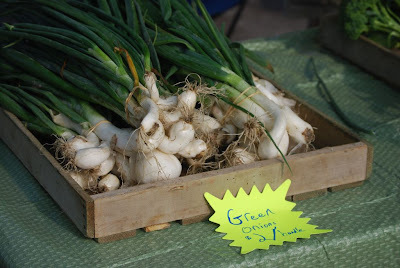 We'll have asparagus, beans, peas, salad greens, spinach, potatoes, cabbage, onions, leeks, broccoli, greens, herbs, berries and much more at the Market this weekend. A couple new additions to tell you about - Staff of Life Bakery & Farms of Dwight, IL will offer up stoneground wheat breads, cookies, and quickbreads in Row 5. Roth Countryside Produce from Morton, IL is back, also in Row 5. 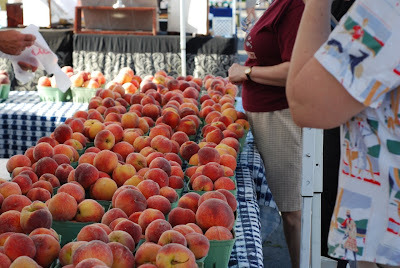 Mileur Orchard will be bringing their peaches and other stone fruits starting this weekend - find them in Row 4. U-Cycle will be out at the Market, ready to answer any and all questions about the City's recycling programs, including the new rgulations for the battery recycling program. Come visit Courtney at her tent, which is right next to the City's tent at the northwest corner of the Market. Also, Urbana's Fire Rescue will be "filling the boot" for the Muscular Dystrophy Association this Saturday. They'll be the guys with the fire engine on the blocked-off area of Walnut Street - go visit and help them fill that boot! Lastly, if you like photos of the Market, go check out our Flickr photostream - new photos are usually posted every Monday or so. Food for the food nerds, crowd shots, photos of sparkly bits and colorful odds and bobs, farm photos - if it's Market-related, it's there. As always, you can always drop me a line at ljbralts@city.urbana.il.us . I spent a few hours today visiting the farms of a couple of the Market's growers. While all new growers are visited prior to being allowed to sell at the Market, established growers are visited much less regularly. I'm trying to get to all of them this season. I saw much of the food Market patrons are already enjoying (asparagus, berries, potatoes) as well as the food they'll be enjoying in a few weeks (sweet corn, green beans, eggplant). There's a lot growing in those fields, and it's not all just soybeans and feed corn, y'all. Make the Market part of your weekly grocery shopping! 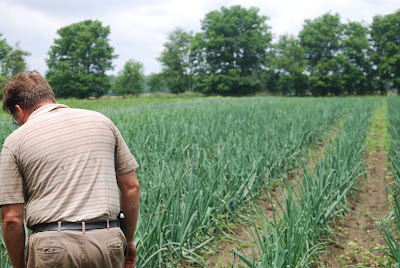 Your local economy (and farmer, and taste buds) will thank you for it. 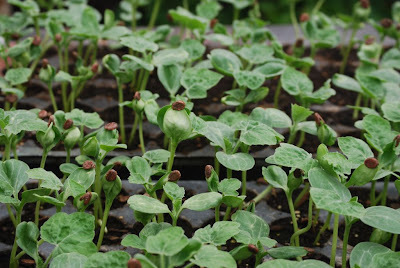 To see more photos of Kleiss Produce Farm, click here. To see more photos of Meyer Produce (including photos of his tropical greenhouse - bananas, figs, and pineapple - I kid you not), click here. At the Market this week: lots of strawberries, a few blueberries, asparagus (nearing the end of the season, so stuff yourselves), chard, kale, salad greens, spinach, peas, green onions, potatoes, turnips, radishes, arugula, fresh herbs (it's pesto time!) greenhouse and hydroponic tomatoes, cucumbers, zucchini, and maybe a few surprises. Don't forget our excellent selection of baked goods, farm-raised meat, eggs, and goat cheese, and our huge selection of handmade clothing, jewelry, woodwork, soaps, and other craft items. We have more vendors of all kinds coming in throughout the next two months, and the Market will be as full as it's ever been. Don't forget to shop all five rows... you might miss something. Art at the Market: Urbana's Public Arts Program offers up the latest installment: local artist Renner Larson encourages patrons of all ages to collaborate on an oil pastel exploring our feelings about water. [My feeling: it better not rain. Other than that, we're good.] This workshop is free and open to the public and will be taking place on the blocked-off section of Walnut Street, on the west side of the Market. Come on out and get arty! World Wide Knit in Public Day: Knitters and non-knitters - show your solidarity with knitters worldwide this Saturday by coming out and knitting with the folks from Klose Knit in Urbana on World Wide Knit in Public Day! They'll be knitting, purling, and yarnovering right next to the City tent at the NW corner of the Market. Second Saturday: The Urbana Business Association is sponsoring Second Saturday all summer long. Check out Urbana's Downtown renaissance on the second Saturday of each month through August - downtown merchants will be showcasing their wares outdoors and the atmosphere promises to be festive. Kudos to Prairie Fruits Farm, one of the Market's most popular vendors (Row 4, east side), on their appearance in the July issue of Bon Appetit magazine! 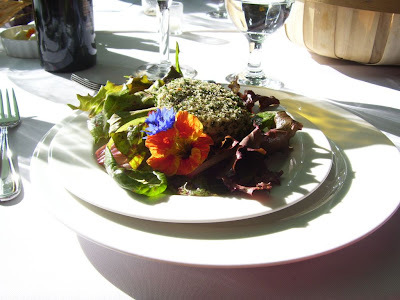 Also - did you know Triple S Farm (Illinois St. row, south side) has its own website now?? Look for more content as the season progresses... and look for other vendor websites coming soon. 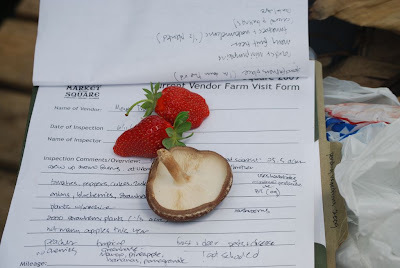 Last week was the Market's best-attended week yet, no doubt helped along by sunshine, the appearance of strawberries and blueberries and the continued presence of asparagus, and an awesome sculpture workshop led by Urbana's Public Arts Program. This week: We'll have more strawberries, more blueberries (come early), lots of other late spring produce, partly cloudy & warm weather, and visitors like The Urbana Free Library and Illinois Public Media. Illinois Public Media's theme this month is "Young Learners", and they're offering a Market-wide scavenger hunt. Bring the kids! That's right - it's the Market's rooster in bike rack form! The City has added 40 new bike parking spaces just west of the Market's lot. You can't miss them - there are four decorative U-racks and a host of shiny black ones. Hitch your ride to one of these and your bike will be safe (and close by!) while you're in the Market.